It’s hard not to let the buzz of everyday life simply slip away at Rocking Rackets, where the magnificent landscape and open space, abundant with wildflowers and wildlife, serve to remind its visitors to slow down, breathe deeply, and effortlessly soak in the natural beauty of the West. The Rocking Rackets cabin is a unique and historic western property that was hand-built in 1925 with a larger addition added later. Rocking Rackets is a two bedroom, single bathroom cabin that sits on two private acres inside Grand Teton National Park, granting its visitors a blissfully-secluded atmosphere to unwind in with family and friends. Whether you’re in the mood to just soak in the natural beauty and enjoy the fresh mountain air or work up a sweat in some of the most stunning nature in the West, Rocking Rackets is an exceptional location for either. Unobstructed views of the picturesque Tetons and sage meadows below can be admired from any of the decks at the cabin, or visitors can easily get up and personal with the alpine terrain with direct access to countless biking, horseback riding, and hiking trails nearby. Rocking Rackets is also just five minutes from Teton Village and a beautiful 20-minute drive to the historic town of Jackson when you’ve had your fill of pronghorn and bald eagles for the day and are looking to treat yourself to an evening of dining and drinks at one of the many lovely restaurants in the area. Shortly after entering Grand Teton National Park you’ll find the private gravel road that leads to Rocking Racket’s driveway and the quiet of the area will have already set in. The front door is on one of the three decks, in front of which you’ll see outdoor seating. Once inside the cabin you’ll see the open concept living room and dining area are straight ahead. Wooden stairs between the dining and living areas will lead you up to the quaint guest bedroom loft which hosts two twin beds. Back in the dining area, if you take a right you’ll find the kitchen and then the bathroom to the right once in the kitchen. Past the kitchen is the master bedroom with one of the two wood-burning stoves in the cabin. Additionally, the decks on the property almost completely wrap around the cabin. Master Bedroom - The master bedroom is located on the original side of the cabin with original wood floors and log beams. Additionally, there is private outdoor access from the master bedroom. Charming paned windows behind the king-sized bed fill the room with natural light. The room also hosts a sitting area and a small wardrobe. Grab a book, a loved one, or a glass of wine and curl up next to the fire while the peace and quiet of the national park settles in. Kitchen - The kitchen is also located in the original part of the cabin, between the master bedroom and the living and dining room areas. Enjoy a peaceful breakfast in this charming kitchen while sitting at the breakfast nook with a hot cup of coffee and fresh eggs scrambled in a cast iron pan, gazing out the paned windows and soaking in the beauty of Grand Teton National Park. Living and Dining Areas - This part of the home was added on later to the original cabin. This bright area has high ceilings, light-colored wood, and abundant windows. The dining room hosts a wooden table with places for ten guests. 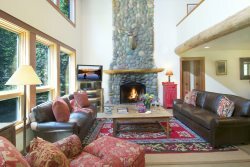 After dinner or a long day spent in the wilderness, there is plenty of space for family and friends to sprawl out into the living room and play games while cozied up to the warm, wood-burning stove. From the living room you have three access points to go outside. The front deck is covered, spacious and has two sets of outdoor furniture. Often there are a dozen or so different bird species that can be seen while sitting on the deck as well as other little critters such as chipmunks and squirrels. Deer, moose, and foxes have also been known to make an appearance now and again. Loft Bedroom - The wooden stairs in the living room bring you up to the loft, a quaint room with two twin beds, a nightstand, a wardrobe and two dressers. The view from this room of the surrounding scenery is quite stunning! This room is often utilized by children to sleep in, but please be careful on the wooden stairs with very young children or people with disabilities in order to avoid any potential safety issues from slipping or falling. - As fore mentioned, the cabin is located in Grand Teton National Park and offers the opportunity to enjoy the beautiful scenery and to connect with nature. That being said, there is a high possibility that some of that nature may want to come into the home. It is not uncommon for a chipmunk to pop in and say hello if you leave the doors open for too long. Additionally, mice are a part of the natural ecosystem in Grand Teton National Park and given the natural setting at Rocking Rackets, they are part and parcel of staying at a cabin in a location like this. We do our best to reduce the occurrence of such but it is an inevitable part of staying at the cabin. - There is an outdoor fire pit on the property, however, it is strictly prohibited for guest use. The risk of starting a wildfire in the national park is simply too high. There are two fireplaces in the home and if you would like, a staff member can come to the cabin and manage the outdoor fire pit for a fee. - The road to the cabin is a dirt gravel road. It is necessary to have an SUV or other vehicle with a higher clearance as the road is dirt and commonly rutted for a half mile. - The cabin does not have a dishwasher or a clothing washer and dryer. The closest laundromat is "The Missing Sock" near Smith's grocery store in South Jackson. Jackson Lodging provides some essential items one may need for their stay. We place linens and terry in the unit, which are washed with Green Seal-certified detergents. Toiletries (shampoo, conditioner, lotion, mouthwash, a grooming kit, toilet paper, and Kleenex), dish soap, sponges, trash bags, etc., are provided for your use at no additional charge. Kitchen amenities, other than coffee filters, are not provided. There may be items such as spices, ketchup, salt, and cooking oil at the property that have been left from previous guests. This cabin is cleaned with Green Seal-certified products for your health and the environment. Firewood is also provided for this property. Upon your arrival please review the guest book as there are important details on check-out procedures and all the amenities the property has to offer, including how to start the fireplace (if applicable). Once again, thank you for choosing Jackson Lodging Co. for your vacation lodging. We hope you enjoy your stay and look forward to welcoming you back soon!